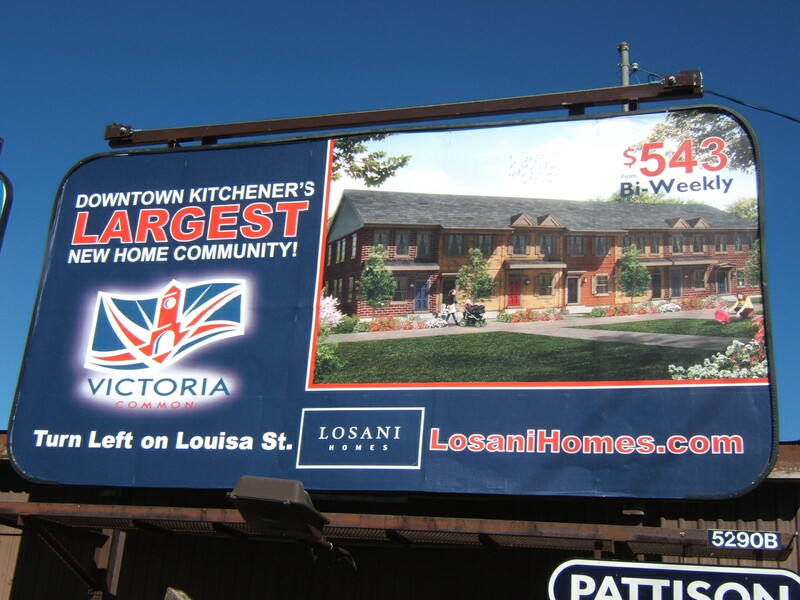 So there is a large townhouse/condominium development being built in town called the Victoria Common. 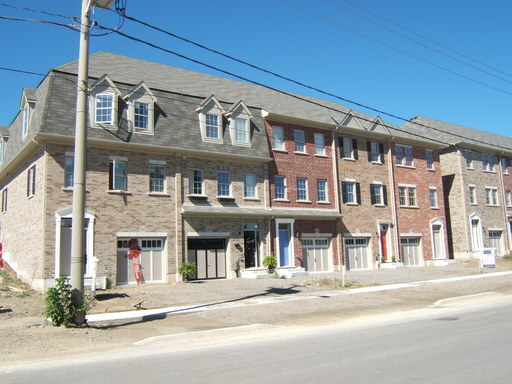 Several townhouses have been built already, and people have moved in. 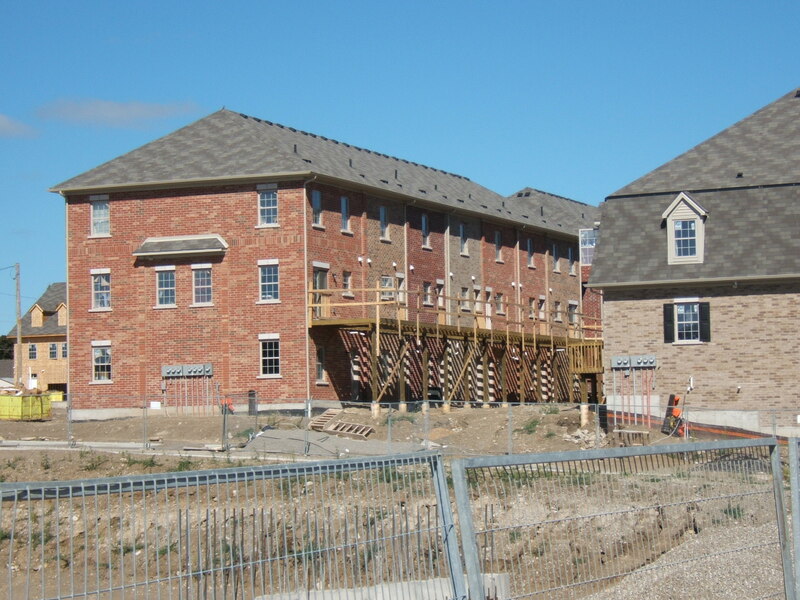 Recently, the development was in the news because there was a big fire that destroyed several of the townhouses. Overall I am supportive of the complex. The area on which the development is being built used to be a big ugly empty lot. I strongly support infill development, even if that development means tearing down old decrepit buildings to put up newer, cleaner, more densely populated ones. I strongly support the Region of Waterloo's countryside line, and I strongly support the region's strategy of discouraging land speculation in the farmland near the countryside. Because I strongly support the countryside line, I may or may not strongly dislike Lonsani Homes, the company that is building the townhouses. If this company is one of the cowardly companies that took the Region to the Ontario Municipal Board to win more greenfield space, then overall I dislike the company. (It is difficult to tell which companies are involved in the lawsuit, because some of the appellants are cowardly listing numbered Ontario corporations instead of their brand names. We do know that Activa Holdings, Stonefield Properties, Northgate Land Corporation, Hallman Construction, Gatestone Development Group, Mattamy Development Corporation were represented by lawyers, and therefore you should do no business with them if you value farmland in Waterloo Region.) The decision by the Ontario Municipal Board has been disastrous; the thousand hectares of land the developers have been awarded (how does that even work?!) destroys the Region's strategy of holding the countryside line fixed. The artist depiction features a lot more lawn space than the actual houses have. The real townhouses have large garages built into them, with corresponding driveways. The artist depiction has neither driveways nor garages (nor cars). Isn't that fascinating? Even this inner-city infill development tries to advertise its wares by portraying a car-free world in which garages are not necessary. I believe this depiction is intentional. I think that many of us would prefer to fantasize about living in housing where cars are not necessary, and this billboard plays to those fantasies. Housing advertising is rife with this kind of deception, of course. The awful greenfield developments along the edge of town all come with bucolic names that in no way reflect their actual condition: "Forest Glen", "Eagle View", etc. Even "River View" is misleading; any river views are obscured by the neighbours. The housing manufacturers are selling us dreams, and the dreams they sell conveniently ignore those aspects of reality we would rather not think about. It looks like the backs of the townhouses are built with patios raised above the ground, not walkways for young mothers and their children to use for frolicking. There is some relationship between this misleading advertising and the countryside line, although I cannot articulate it properly. 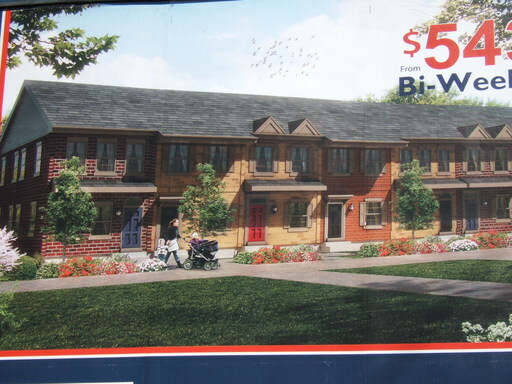 It has something to do with deception: thanks to this OMB decision, the region will have to give up a thousand hectares of farmland so that developers can sell customers delusions of bucolic suburbs that do not actually exist. The irony is that we have those bucolic surroundings now; because sprawl in the region is limited, it is possible to get out to bucolic farmland (and the associated farmy pig-manure smells) by cycling for half an hour. Try doing that in Brampton. The Region of Waterloo (along with the province?!) is appealing the Ontario Municipal Board decision. I do not think they will win the appeal. If they are lucky they may get the number of greenfield hectares they need to provide reduced from 1053ha, but their original proposal to allocate 85 hectares will not stand. That means the Countryside Line is dead: every twenty years land speculators and developers will take the region to court, and every twenty years they will be awarded more and more greenfields. If deceptive advertising is mandatory then I would prefer that it be used to advertise infill development rather than greenfield suburbs, but that is not the future we have in store for us.